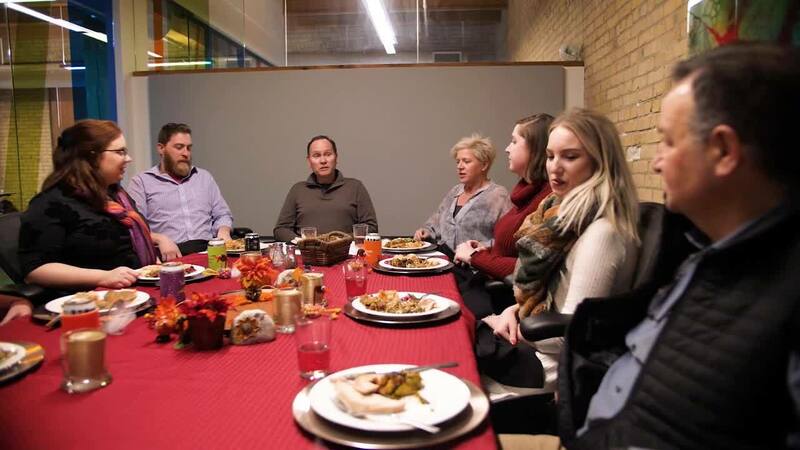 The Demanico team took some time out to sit down, share a meal, and share what we're all thankful for. With the holiday season in full-swing, we're all preparing to take a little break from our computers to enjoy Thanksgiving weekend with friends and family. Before we go, the Denamico gang wanted to take a little time out to share what we're all thankful for. While we're all extremely thankful to work where we do, with the people we do, we thought it would be great to hear exactly what everyone in the "Denamifam" is thankful for. I'm thankful for working with a wacky team of tech-savvy individuals dedicated to finding solutions and opportunities for businesses to grow and delight their customers. Also thankful for the best office coffee in the North Loop. I'm thankful for support to grow personally and professionally. I'm thankful for our spontaneous summer scooter breaks. I’m thankful for taking the leap to get this job five months ago, and I’m happy to work with fantastic people. I’m thankful for leaders that support and encourage a healthy work/life balance. I'm thankful for the parking lot and that we don't have to figure out our own parking. I'm thankful for a team of continuous learners who are always trying to find a smarter way. I'm thankful for our collaborative work environment - everyone is willing to pitch in and help out! I'm thankful for our fearless leaders, Kristin and Brendon, who encourage our personal development and make us better. I'm thankful for my hilarious coworkers - they make it fun to come into work every day! I'm thankful for our lovely office space - fancy desks, tasty snacks, and windows which let us see the sun throughout the dark Minnesota winter. I’m thankful for scooter rides by the river, company lunches, and vests. Looking at this list, we realize that we all have so much to be thankful for. While this list could go on and on, we're all thankful (and ready) to take a few days off, eat a turkey dinner, spend time with loved ones, and come back to work feeling refreshed (and full) so we can continue to do what we love to do. We hope you enjoy your holiday weekend! Let us know what you're thankful for. Does Your Business Have a North Star?